The manufacturing scene in San Diego -- like much of the United States -- is facing an identity crisis: With the surge of off-shoring abating and companies slowly trickling back to manufacture on home turf, questions about the benefit of bringing these types of jobs back -- if they should be brought back at all -- are on the minds of those in the industry. Some of San Diego’s leading experts in the manufacturing and production field met at a recent Daily Transcript roundtable to hash out some of the issues on their immediate horizon and start a higher-level conversation about whether manufacturing is something the region should be actively pursuing at all. As for some of the top-of-mind concerns at present, lack of suitable employees is a big one. Jim Berg, president of Advanced Test Equipment, said he simply cannot find American engineers capable of -- and willing to do -- the type of work his company requires. He said he’s not interested in using highly skilled foreign workers via visa programs -- he said he wants to hire U.S. citizens, which is proving increasingly difficult. 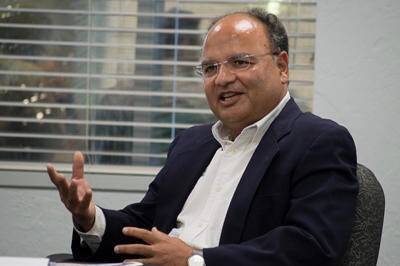 Vipul Doshi, vice president of Nortek, said his company is facing a similar challenge, even after going to great lengths to give opportunities to local students. Roundtable participants postulated a variety of reasons for why this might be -- everything from the high cost of living in San Diego, to the work ethic of this younger generation, to a desire to hit it big fast at a startup, and the decision to work for bigger-name companies such as Google (Nasdaq: GOOG) and Apple (Nasdaq: AAPL). Many of the participants agreed that one key aspect of any solution to this issue is more collaboration between manufacturers and schools to properly train students -- both high-level engineers and technically trained workers -- in skills needed for careers in manufacturing. Keith Easler, program manager at Lumedyne Technologies, added that his degree at SDSU was in manufacturing engineering, a program that is no longer available there. Issues surrounding the cost of renting or buying space to manufacture in San Diego also surfaced, but no one said they viewed Tijuana as a viable alternative to keep their production facility close to headquarters. Long also said she had quality concerns because the diving suits and equipment her company manufactures require extreme precision, a level of quality she’s not sure she could accomplish south of the border. Doshi said that Nortek does not have any facilities in Tijuana either, though it does have a factory in Tecate and recently bought about 100 acres in Monterrey to relocate its Missouri and Oklahoma sites. A divergence of opinion surfaced when talk came up of San Diego potentially increasing the minimum wage and implementing a state requirement for employers to give employees three paid sick days. Long said if these regulations pass, she’ll likely be forced to cut one of her employees’ two vacation weeks to accommodate for the sick leave since her margins are too thin to absorb that cost, and raising the price of the products is out of the question in this global marketplace. The minimum wage issue also touched a nerve for Berg. Bryan Pate, co-founder and co-president of ElliptiGo, which is headquartered in San Diego but manufactures its elliptical bikes in Asia, disagreed. “My employees aren’t that motivated around salary -- it’s a lot of passion for what we’re doing,” Pate said. If an increase in the minimum wage, a lack of suitable employees or unduly burdensome regulations does make manufacturing in San Diego too cost-prohibitive, what is it that the region would be missing out on? Long echoed his concerns that cutting out manufacturing as a segment of the economy would lead to a class polarization, with high-level engineers and people working at burger joints and nothing in between. Not everyone was so convinced. “If you think about the hierarchy of value-add, where does wealth come from?” Pate asked. “We either take it from the ground … we work for it by moving something or building a house for example, or we create an idea that is a better way of doing things. Mignone said that perhaps it’s time to develop a different paradigm for manufacturing here. Easler suggested constructing a manufacturing zone of sorts, where companies could pool their individual funds to create a production site capable of making a variety of products, that is then the party responsible for hiring and providing its employees’ benefits, as opposed to the company placing the orders having to account for that as well. If the roundtable participants are any indication, it seems the jury is still out on that. Keith Easler, Program Manager, Lumedyne Technologies Inc.
Bryan Pate, Co-Founder and Co-President, ElliptiGO Inc.